Indecision is often worse than the wrong action!!!! Annual Potluck Holiday party with raffle drawings Saturday December 5th, at 6:00pm! RSVP as soon as possible! Katie started with American Academy of Self Defense in June of 2012. Katie is joined by her sister Annie, and brother Tommy! 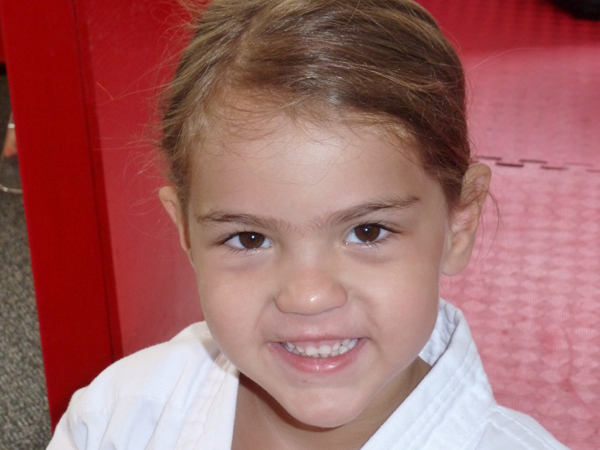 Katie brings a sense of enthusiasm and knowledge to every class not normally found in someone her age. Sifu Rick & staff are very pleased with the progress of Katie as of late, showing a true sense of detail that is second to none. Sifu Rick & Staff would like to salute Katie’s parents Amie & Kevin for all their support of not only Katie, but our Black Belt school as well. Job well done! This month’s focus is on courtesy. One of the great attributes we develop as a martial artist is courtesy. One important way we show courtesy in martial arts is with our bow. We can bow on and off the mat to display courtesy to our school and instructors, and even bowing to our fellow martial artists. Here are some reminders of simple ways to extend courtesy to those around you, on and off the mat. Greet everyone politely; not only students, but family, friends, teachers and even strangers. Welcome new students on their first day. They are probably nervous like the rest of us were on our first day of training, so make them feel part of the family. Saying “please” and “thank you”. These are simple words, but they mean so much. Raise your hand in class or follow class protocol when you have a question. Smile. Don’t sneer, snicker, or smirk. If you smile, you may just make someone’s day. It’s contagious! Say “yes, Ma’am” and “yes, Sir”. Before you start your sparring match, you tap the mitt of your opponent in good sportsmanship. If you win a sparring match or a game, show courtesy and be gracious with your win. Do not litter. Always use a trash bin. Always apologize when you do something wrong, if you hurt someone, apologize even if it’s an accident. Don’t embarrass another person. It is not polite to embarrass someone. It is considered rude and mean, and it makes you look like a bully. Hold the door open for someone. Go out of your way to help someone out who needs it, especially your elders. Everyone knows sleeping is essential, however it is among the first things we take off our to-do checklist. You will have to reconsider making sleep a priority, especially when you consider the effect sleep has on different aspects of your life. Additionally, you want to lead by example for your children. Getting the right amount of rest is an essential component of every child’s healthy development. A recent UCLA study found that a continued lack of sleep could result in weight gain. Scientists found that not getting enough sleep affects the amount of ghrelin, a hormone that helps with appetite control. So if you don’t get enough sleep, you have lower levels of ghrelin, which means you will be hungrier the very next day. As adults, we want all the brain power we are able to get and making sure you are getting the right amount of sleep does just that. When you don’t get enough sleep, proteins increase in your head, which is why you get that fuzzy feeling. So, how does lack of sleep affect your children? Well, much like you, your youngsters are more inclined to have weight issues when they do not get enough sleep. A Harvard medical study found that toddlers who slept below 12 hours each day were two times as likely to end up overweight by age three. Children who receive the ideal amount of rest are generally happier and have sharper minds. Kids who do not get enough sleep usually have a more difficult time focusing, making it harder for them to learn. Allowing your children to sleep in on the weekends won’t make up for a lack of sleep during the week, but it can disrupt their sleep cycles. Kids will be kids; there is no getting around that. Every child will certainly have their share of bumps and bruises, but you can minimize these occurrences by making sure your child gets enough rest. Well-rested children are able to think more clearly and remain more alert throughout the day, which can help them steer clear of making careless mistakes. So, for both children and adults, it is essential that we get enough sleep every single night. Begin tonight; make sure everyone in your family gets the rest they need.